Choosing a rug with a bold color or pattern might sound intimidating, but if you fall for a rug with an amazing color or pattern, there are ways to make it work. Here are a few tips for making decorating with those bold statement pieces. Keeping your bigger pieces of furniture more neutral definitely helps keep your options open if ever you decide to redecorate, but it also provides a place for your eyes to rest when you have a big bold area rug on the floor. Playing up the brighter colors with an accent chair like below, is much less overpowering. While you might not want to use those bright colors from your rug in a big way (such as a sofa), bringing in a few accessories that match your accent color will help your rug blend easily into the rest of the room. Whether it’s artwork or throw pillows, it’s easy to carry a bright color through the room without overwhelming the space. Sometimes you fall so deeply in love with a color or pattern it just seems a shame to cover it up. 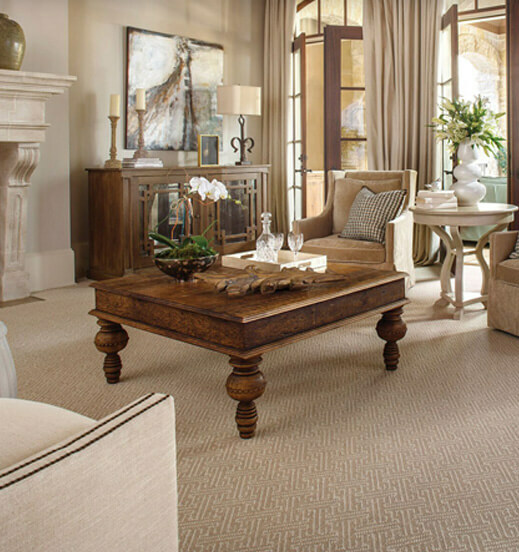 Consider swapping out a bulky wooden coffee table for a clear one made of glass or acrylic to showcase your new rug. Those see-through pieces will allow you to enjoy more of your rug without sacrificing your coffee table. One of the biggest arguments against bolder area rugs is boredom. People fear getting bored with such a bold pattern, while more neutral rugs are easier to live with for longer periods of time. But where’s the fun in that? Staircases and other “connecting spaces” are perfect places to try out a bold, colorful pattern. Because we don’t tend to dwell in these areas for extended periods of time, it takes longer to get to that bored stage. Entry ways, mudrooms, and laundry rooms are also great places to try out bold pieces. A rug with a bold pattern or deep, rich colors will be the most forgiving of spots and stains, making them ideal for homes with pets or small children. Natural fibers like wool also tend to release stains more readily than some synthetic fibers.